Ask fellow campers about "Big Bone Lick State Park" and nearby attractions. Site #61 is a back in and was too steep to level trailer. Host helped us move to site #19 which worked. Sites on top are ok.Sites off Ridge are short and hard to level up. This a very beautiful park . We camped at Big Bone Lick State Park in a Travel Trailer. Creation Museum ,Walking , kicking back. Stayed at Big Bone Lick as a base camp to attend the Quaker State 400 in nearby Sparta, KY. The girls stayed back at the park and enjoyed the clean swimming pool. Site 11 was level but did require 75 foot of water hose to reach the spigot. Bathrooms were clean and showers as well. This park is at least 10 miles from any gas, restaurants or shopping so bring what you need. We camped at Big Bone Lick State Park in a Travel Trailer. Decent state camping park. Sites are not very level. You will need at least two or possibly three water hoses here. Showers dated but acceptable. Small store sells ice and other items. Mini golf is also available as well as a swimming pool. Very nice setting. We camped at Big Bone Lick State Park in a Travel Trailer. Smaller park with well spaced out sites. However, many sites are very unravel despite being asphalt....plus, not big rig friendly. Tight fit for our 32' fifth wheel. Nice pool, though small, and it was not being refilled with water...level clear went down. There is a nice putt putt course, sadly there was a tree that had fallen down on the course some time ago and never cleaned up. Camp hosts were active putting reservation forms on site poles. Dump station was adequate. Water source was shared between two sites...thankfully, we had 50' of hose. Convenient to half way point to family in Louisville with camper. So, we will probably stay here again...it's ok and works for us. Met nice people from Louisiana and North Dakota. We camped at Big Bone Lick State Park in a Fifth Wheel. 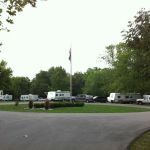 Quite a few campers stayed here as a base to tour Cincinnati, the Creation Museum and the full size Ark Experience. People were really impressed. Some park trails plus a park museum, bison, lake and sulphur spring. Rabbit Hash is 15 minutes away but could not find a place to park dually truck with hundreds of bikers there. A few wineries nearby...must visits! Grandkids and pool seemed most popular activity for us! We live close and wanted to take our granddaughter camping for a couple of days and chose Big Bone....the site was fairly level but a lot of the sites are not so beware when you make a reservation you may need some blocks. The electric was fine, but I needed the third hose to get to the water spigot, so make sure you got 75 feet of hose. No full hookups, but the dump station is easy in and out The sites are somewhat large but open, so privacy is not going to happen.There are trees throughout the campground, so there is some shade at most sites. The restrooms were clean and plenty of hot water. We got a lot of over the air TV stations and cell signal, ATT, was for the most part was non existent Interior roads are big rig friendly, sites are asphalt with a gravel patio area with picnic table and fire ring. Staff was nice as always, putt putt, pool and playgrounds for everyone. Don't forget to go and see the Bison, not as big as the ones at Yellowstone. It's a nice park to relax and visit the Ark or the Creation Museum that are close by. We will stay here again. We feel this is a very family friendly park and encourage you to enjoy it sometime. We camped at Big Bone Lick State Park in a Motorhome. My wife and I camped on site 35 for 4 nights. The site was level enough, however the water hook up required 3 hoses to reach. When you look at the alignment of the waterline it would have been so simple to add a riser and provide water close to the site. I have never been to a campground for 4 days in my life and not talked to a single person. Not friendly to folks they don't know or are not a regular. We camped at Big Bone Lick State Park in a Fifth Wheel. Close to shopping and anything you could want. Bring plenty of water hose. The park road to the campground is very steep with a sharp curb at the top. Check your brakes before leaving for sure. Very nice well kept campground. The lady at the desk worked hard for me with some of my issues. Recommend to anyone. 2 minor issues for me. Leveling was one the other was we needed 2 hoses for water and only had 1. If you go be sure you have 2 hoses if you want water. We camped at Big Bone Lick State Park in a Travel Trailer. We have stayed here on a couple of occasions. Nice and quiet. The campground is at the top of a hill. Great areas for kids to enjoy (playground, pool, putt putt). A lot of things to do in the surrounding area. We went to the Creation Museum and the Ark the last time we stayed. No sewer hook ups but easy to access dump station. Only up to 30 amp electric. We would definitely stay here again. We camped at Big Bone Lick State Park in a Fifth Wheel. We stayed here 4 nights to visit the Creation Museum and Ark Encounter. Spent so much time there, we didn't hike any trails or view the buffalo! Customer service was excellent. Please heed the advice to bring more hose length... we used two to reach our rig. Other than the lack of level sites, 50 amp and sewer, we loved this park and will return again for a longer stay. We camped at Big Bone Lick State Park in a Fifth Wheel. This is a very nice state park CG. We were only here overnight so did not hike any of the trails or see the bones. The sites are paved but not very level. The park is about 10 very hilly and windy miles off I-71. There is 30 amp power and water at every site. Dump station on the way out. Lots of trees, and sites are not close except for a few right by the pool/bathhouse. Well-maintained and probably jammed on busy weekends. I don't know if there is much to see/do in this area but this is a pleasant state CG for a stopover. We camped at Big Bone Lick State Park in a Motorhome. Make sure you have plenty of water hose when camping here. We had 50' of hose, which was not enough, and then had to go in search of an additional hose. Sites are fairly short and unlevel. Staff is friendly. State needs to spend some money on upgrades for the restroom, laundry facilities, and maintaining trails (muddy). Mini-golf course could use some upkeep also. Good location for visiting Ark & local attractions in and around Cincinnati. 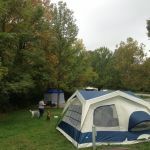 After visiting some of the privately-owned campgrounds in the area, we were pleased we chose this one. We camped at Big Bone Lick State Park in a Fifth Wheel. Well maintained park. Only 35 minutes from downtown Cincinnati but feels like it's a world away as it's a pretty setting up on a hill. At & t cell signal was weak to nonexistent. Received 17 over the air TV stations. Bathrooms were old but clean. Sites were somewhat shallow (many had to park sideways in front of their campers or elsewhere) and the sites were mostly unlevel. Sites had decent separation with the exception of those in the two circle loops which were too close together for our comfort. The camp store has the basics but Florence is only a 15 minute drive with all the stores you could ask for. A rather small bundle of firewood was $5 but just outside the park there's a guy selling firewood out of his driveway for the same price and a larger bundle. There's a nice playground in the campground and this place is loaded with families. Minature golf 0n site. As others have stated bring enough water hose because the water hookups are shared and might not be very close. We camped at Big Bone Lick State Park in a Travel Trailer. Great place for a weekend trip. The museum is a little out of date but they have great trails, good facilities and a bison viewing area. We camped at Big Bone Lick State Park in a Tent. This was an overnight stop for us and this appears to be a very popular campground with a mix of tents and RVers and lots of kids. Looks like that it is big rig friendly depending on the site. Utilities were fine but the bath house was old and needed much more attention due to the high volume of users. Had 2 bars of Verizon LTE at our site but only 3G at the campground entrance. Campground hosts were very friendly and attentive. Public roads to the campground are pretty narrow. Do not take Exit 171 off I-75 because some of the roads are extremely narrow for our dually truck. Campground had a very popular pool and miniature golf. I liked this place better than my spouse and we probably would not stay here again. SWe stayed in a motorcycle tent trailer. We camped at Big Bone Lick State Park in a Tent Trailer. No nearby grocery stores. One has to hop on the interstate and go either north or south on I-75. Fuel located near interstate. Not far from Cincinnati. If you are traveling with a buddy suggest sites 33 and 34 great layout. 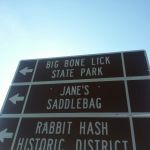 Are you affiliated with Big Bone Lick State Park ?